Apparently, “P” is for partnership. The company behind “Sesame Street” has signed an expanded deal with digital-book publisher Callaway Digital Arts to create three more iPad apps. 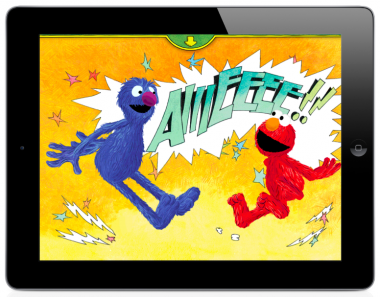 The companies aren’t saying what the two other new titles will be, but CEO Rex Ishibashi said they might not just be digital versions of existing “Sesame” books. In the meantime, the companies are at work on updating “Another Monster At the End of the Book” to take advantage of the high-resolution screen on the new iPad. Ishibashi said his company, which remains exclusively focused on the iPhone and iPad, is excited by the high-resolution screen, voice input and improved camera on the updated iPad, and expects to take advantage of those features in the new apps. “All the other companies are two to three tries away from hitting the iPad 1, and here is Apple with iPad 3,” Ishibashi said. The new “Sesame” titles should help make up for the fact that Grover was at the Consumer Electronics Show and I missed it. As for Callaway, the company is working on more homegrown titles in addition to those licensed from Sesame Workshop, Mattel and others. Ishibashi declined to release any download numbers or financials for the company, but said its workforce has expanded to nearly 50 employees, up from 30 when he joined in October 2011. He said the company expects to double its headcount this year.